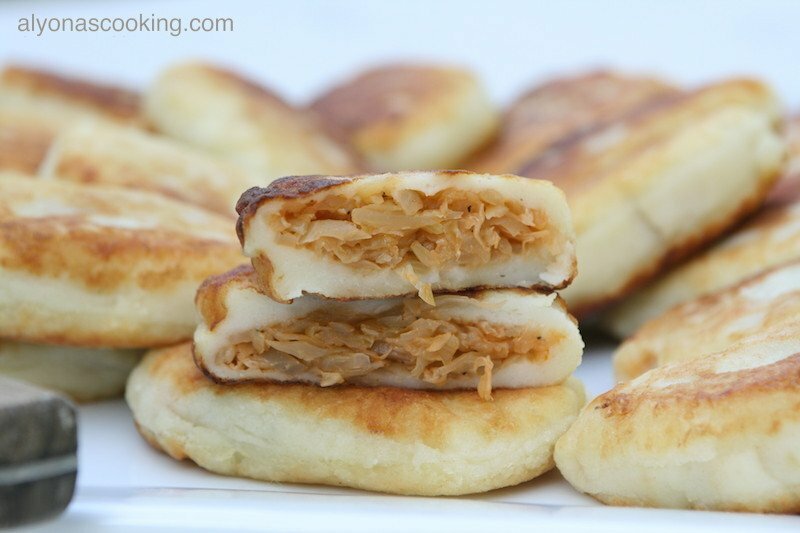 Stuffed Mashed Potato Patties ( Zrazy ), are well-known in the Slavic culture. 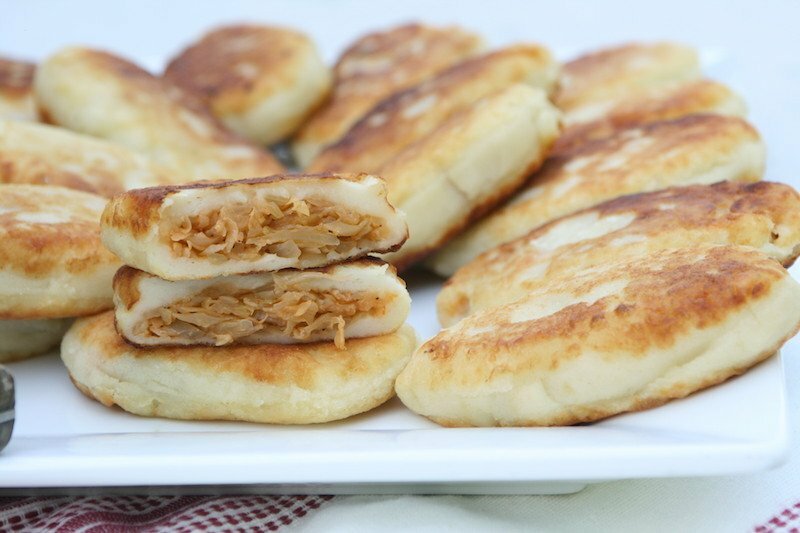 They are oval-shaped patties made from cold mashed potatoes and usually stuffed with braised cabbage or meat. 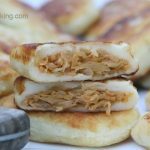 This recipe is very simple as your just combining flour and mashed potatoes to form a soft dough (the dough reminds me of play dough, it’s very easy to work with) and then stuffing with desired filling. My mother used to work in a very large cafeteria back in the Ukraine (that feed up to 600 people) in her teen years. She said that they would make these zrazy, which were very liked by doctors. I can certainly see how these can become a favorite because they really are that good! So if you haven’t tried them, you really need to. Using your favorite mashed potato recipe; (as long as it’s smooth and calls for some butter) add 1 2/3 cups of flour to the 6 cups of mashed potatoes. 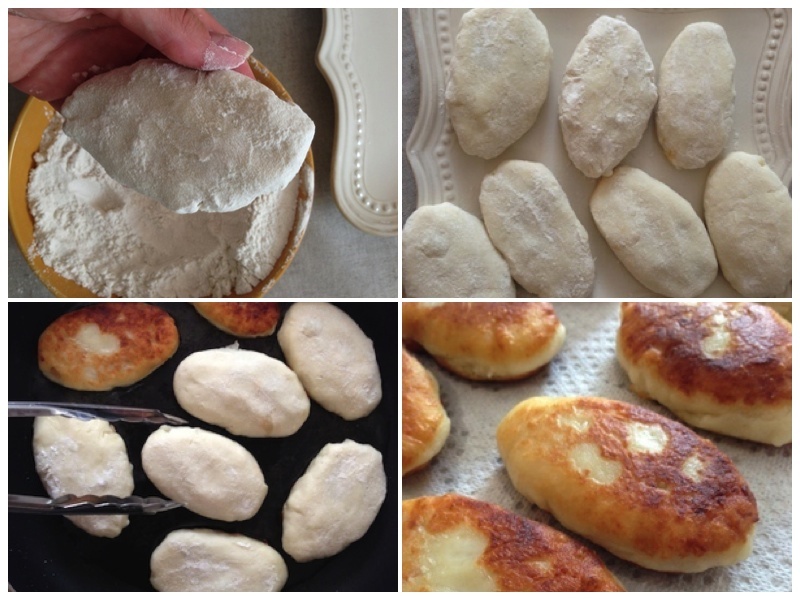 You could add more flour to the dough to form tougher patties but I like mine very delicate. 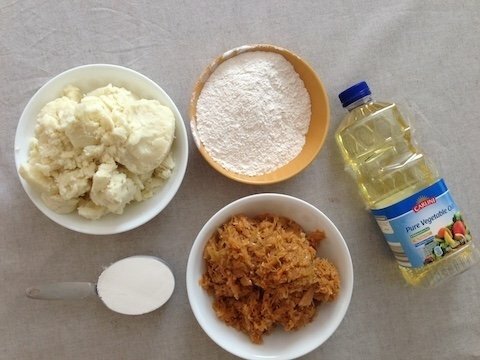 (The more flour you add the less you will taste the mashed potatoes and the more it becomes tougher. I wouldn’t exceed more than 3 cups. )You can also heat up your potatoes in the microwave for a minute or so just to smooth it out if it’s very stiff and cold. You do not want the potatoes to be hot. Scoop out dough using a 1/4 measuring cup. Shape into balls and flatten to about a 4″ circle. Fill each flattened circle with braised cabbage and seal by pinching tops. After you have sealed and filled the dough flatten patties forming into an oval shape. Drench in flour and place on a large tray, continue to do the same with the remaining dough. Heat a large skillet over medium-low heat and add 11 tbsp of oil (enough to completely cover the bottom of the frying pan). Fry patties on each side for about 4 min. (Make sure the temperature isn’t too low because it won’t brown nicely and it may soak up the grease. They need to be on med-low heat as potatoes seem to brown quickly.) Remove and place on paper towels. 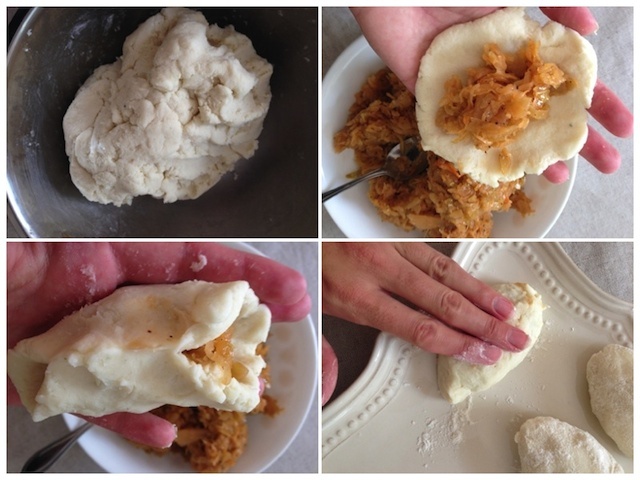 In a large bowl combine the flour and cooled mashed potatoes to form a soft dough. Scoop dough out using a 1/4 measuring cup. Form into a ball and flatten in to a 4" circle. 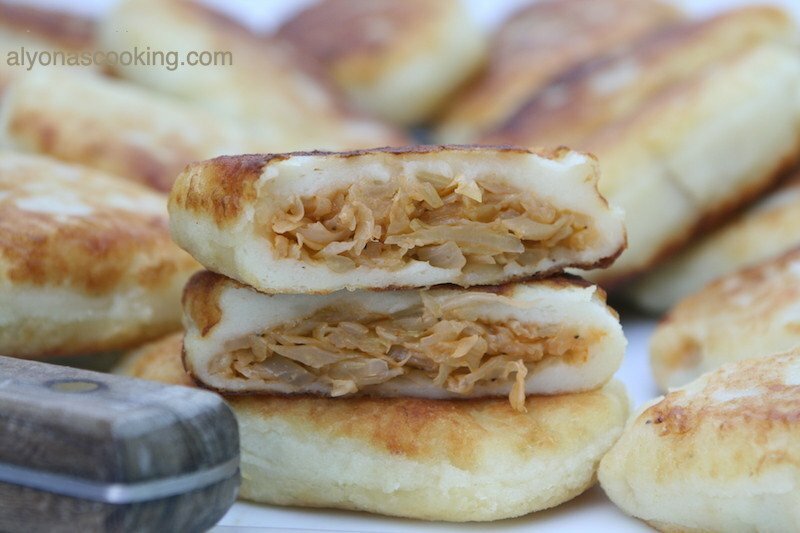 Fill each flattened circle with 1 heaping tbsp of braised cabbage and seal dough, pinching tops. Flatten filled dough and drench in flour; place on a large tray. Repeat with remaining dough until finished. Heat a large skillet over med-low heat and add 11 tbsp of oil (or enough oil to cover the bottom of the frying pan). Fry patties for about 4 min on each side, frying in batches. Place on paper towels and cool slightly before serving. How do you make braised cabbage for this recipe?